The Vice Mayor of Fort Lauderdale, Ben Sorensen, has told SFGN he is moving forward on a non-discrimination ordinance in the city that would cover LGBT people. SFGN reported last week that no progress has been made on such an ordinance, despite the uproar it caused a year ago between then-mayoral candidate Dean Trantalis and local LGBT rights activist Michael Rajner. Last week Rajner expressed his disappointment to SFGN that no progress had been made, despite so many local LGBT groups and others that were, and still are in support. Sorensen said he fully backs a city level ordinance and is now working with the city manager and city attorney on drafting a proposal. Last year Trantalis, Fort Lauderdale’s first gay mayor, argued that because the city is covered under Broward County’s non-discrimination ordinance, there is no need for the city to have its own. That argument doesn’t hold any weight with Sorensen. Keith Blackburn, President of the Greater Fort Lauderdale LGBT Chamber of Commerce, believes the city needs its own ordinance to show people from out of town its commitment to the LGBT community. 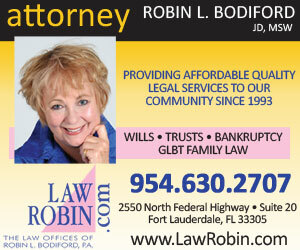 Blackburn said when LGBT related groups are deciding whether or not to choose Fort Lauderdale, they often look at a city’s record on LGBT issues. He said many people abroad have never heard of Broward County and so they wouldn’t know to look up the county’s record. “When people are thinking of Chicago they’re not looking up Cook County, they’re looking for Chicago,“ he said. For Blackburn, it just makes economic sense for the city to have its own ordinance. “We work closely with the Convention and Visitors Bureau, our goal is to bring as many groups and events into the city and area,” he said. Last week District 2 Commissioner Steve Glassman, a gay man, also signaled his support for a city level ordinance.